By Night in Chile, Roberto Bolaño, trans. Chris Andrews. New Directions. 144pp, $13.95. Distant Star, Roberto Bolaño, trans. Chris Andrews. New Directions. 149pp, $14.95. Amulet, Roberto Bolaño, trans. Chris Andrews. New Directions. 192pp, $14.95. Nazi Literature in the Americas, Roberto Bolaño, trans. Chris Andrews. New Directions. 280pp, $23.95. The Savage Detectives, Roberto Bolaño, trans. Natasha Wimmer. Picador. 672pp, $15.00. 2666, Roberto Bolaño, trans. Natasha Wimmer. FSG. 912pp, $30.00.
. . . I conceive, in a very humble way, the totality of my oeuvre in prose, and even some of my poetry, as a whole. A whole not only stylistic, but also narrative. The characters are continously dialoging among them and they are appearing and dissapearing. Zuleiva Vivas: Are your oeuvres tied together? Do the characters from the novels always appear in the short stories? Roberto Bolaño: No, Zuleiva. Some of the characters appear and repeat themselves, and only in some novels and in some short stories, not in my whole oeuvre. 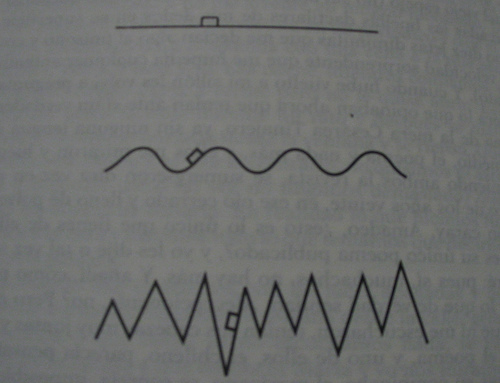 I used to think that the diagram* was everything I had to say about Roberto Bolaño. I was very careful when I drew it, three years ago. I had just finished reading 2666 and was completely overwhelmed by its force. I remember sitting at my wife’s desk, in her rat-smelling lab, thinking about a way of representing the Bolañian Universe. I tried lots of intricate geometrical shapes. After a while, however, I realized that—surprise!—it was just a triangle. How simple! The configuration had always been there, I could see it then, I almost had its vertices and rough proportions, and now I just had to find the way to fit the rest inside those three points. “Good!” I thought. I have always liked puzzles. 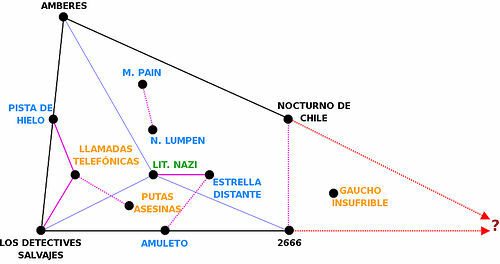 The diagram compresses the personal experience that started when, during early 2002, my friend Claudia recommended that I read this Chilean author. I had never heard his name before. It sounded like the name of a popular Mexican comedian. Not knowing better, but confident of Claudia’s good taste, I checked out Los detectives salvajes from the library and started reading. The book was hard at the beginning. I first thought it was one of those coming-of-age novels I usually hate, you know, the young apprentice, a bunch of older and eccentric people who adopt the kid, sexual issues, poetic terminology, some drugs, the ’70s, those kinds of things. Rapidly, however, that feeling faded, and as I got more and more involved in the story it was replaced by this, let us say, vertigo. And so I kept reading, collecting clues, following the voices of this generation of forgotten poets as Bolaño embodies each of them and hoping there was something at the end. Hoping this was not one of those novels without a punch-line. Fortunately, when everything came together at the end, a pun-like solution emerged from a clever covering. It was brilliant. I couldn’t stop laughing. It was a game but also a joke, a humongous joke. I felt gratified. I was anxious to read more from him. I needed a new hit, so I went to the library and took one of his first books at random, Llamadas telefónicas, a short story collection, and it didn’t suprise me at all when in one of the stories I met Arturo Belano once again. He looked younger but he was exactly the same. He was living at that time in Spain, near Barcelona. He was hiding, writing, and working as a watchman of a tedious camping club in the Costa Brava. He seemed unaware of what was waiting for him. What really struck me from Llamadas Telefónicas was how clearly I could see the seed of Los detectives salvajes in those earlier stories. True, it was partly because of Belano’s presence, but there was more. I could hear the voices. I could see some of the scenarios roughly explored. I felt as if Bolaño was training for his big joke. La pista de hielo, his first novella, confirmed my suspicions: Los detectives salvajes was what I would call a limit book—the accumulation point of a sequence of stories, of constructions, of linked points in the space of fictions. I guess that was when I started to wonder about the existence—and shape—of the diagram. After all, if he was doing all this on purpose, he certainly had to have a plan. There are several kinds of limit books. Some of them, the seminal, serve as prophets for whatever follows. Some others, like Los detectives salvajes, are a natural consequence of what precedes them. It is natural to distinguish between the realized limit books and the unrealized ones. The first are concrete works; you can see them, you can touch them, you can keep them on the top of your night table where they form improvised ritual totems. The unrealized ones, on the other hand, could be suggested but would never be achieved as something real. They are basically dreams. My feeling is that when Bolaño started writing prose in order to survive during the late ’80s, he embarked consciously in the construction of one of these unrealized limits. That was his way of keeping the insane writing rhythm he had for such a long time: he never stopped writing the same story, and I mean this literally, somewhat following Hemingway’s advice about never going to sleep without knowing what comes next. On the way toward this unreachable book, however, Bolaño managed to achieve several milestones, besides Los detectives salvajes, that were limits in their own right, critical points of his hyper-opus. 2666, or the nightmare. Thanatos calmly walks around Santa Teresa, an industrial city in the state of Sonora, north of Mexico. Death walks calmly around the city turning unknown women into corpses. This fatuous banquet will eventually consume the world, leaving behind a cemetery in the middle of the desert. A five-partite, self-colliding supernovel revolving around death, deserts, ghost writers, lost people, literature, and loneliness. You may wonder, wasn’t that it? I mean, wasn’t 2666 the novel he was aiming toward, the final goal he mentioned in that interview I quoted? I believe that even if Bolaño hadn’t died prematurely 2666 would still have been published posthumously. The “real” and impossible 2666 was larger and richer. My guess is that if Bolaño had lived forever 2666 would have been at the very end of the diagram, located in the vertex where the question mark is. Since he died, since he was mortal (too mortal) after all, we have to resign ourselves to the promise of a triangle and only dream of its asymptotic completion. The importance of these critical points when exploring the Bolañian universe shouldn’t make us overlook the rest of his work. Each book, in my opinion, has a role within the structure. Some are channels for communication between milestones; some suggest intimate links between fictional nodes. For instance, Amuleto, which tells the story of an Uruguayan poet that claims herself to be the mother of all Mexican writers, may be seen both as an extra chapter to Los Detectives or as a short introduction to 2666—or both at the same time. The story is there, it cannot be avoided. Some other books are detailed elaborations of incidents mentioned before or to be mentioned later on. Estrella Distante, for instance, is an expansion of the last chapter of La literatura nazi. One possible beginning of Lalo Cura (Ness Themad could be a good translation, I imagine), a character from 2666, is explored in one of the short stories of Putas Asesinas. And guess who could be the long lost father of Lalo Cura? Guess, just guess . . .
Before concluding, let’s go back to the diagram. Let’s take a last glance at it. It does not feel right anymore. I would like it to be an animation now. I almost can see the dots and lines moving. Perhaps if I tried drawing it with Cabri Geometrie I could make it dynamic and really capture what I feel when I think about those thirteen books. Prose, only prose! I did not consider his poetry. I should have looked at it. After I browsed through the just-released La Universidad Desconocida, a 500-page compilation of Bolaño’s poetry from 1980 to 1993, once again I started wondering if all these fictions weren’t simply elaborated poems pretending to be prose; making fun of us, innocents, readers. I dreamt I was an old and ill detective and I was looking for people who were lost long time ago. Sometimes I looked myself casually in a mirror and I recognized Roberto Bolaño. Now that I check it again, I notice I actually left one fiction aside. The diagram omits Lecciones de un fanático de Morrison a un discípulo de Joyce because I felt that this was just a side-game (and a somewhat private one) between Bolaño and his coauthor. Perhaps I should have found a place for it. What should it be? Should I allocate space for the upcoming posthumous books? Should I consider also the dreamed ones? The dots are moving, I was saying, yes. Amuleto, for instance, is bouncing back and forth between Los detectives salvajes and 2666, while both 2666 and Nocturno de Chile slowly move toward the question mark without ever reaching it. Perhaps one moves faster than the other, but which one? I would have also liked the couple M. Pain and Novelita Lumpen to be moving around the whole diagram, separating and then meeting again like a pair of asteroids finding their way, their orbit, in a particularly complex planetary system. Is it stable? Would it eventually collapse? Unfortunately, I don’t know the answers to these questions. I only took a snapshot at a precise instant, three years ago. Since then the system has been continually changing. It varies as the reader within me does; links are added and lost, even some new planets are under way now. I cannot simply say “This is it” because whenever I read some of Bolaño’s books again, I feel that I could refine the diagram, make it more precise or simply different, more coherent with whatever I have in mind at that moment. Sometimes the diagram appears to represent an immense noir story about Mexican detectives; sometimes it feels like a long digression linking poetry and life, literature and experience. The system doesn’t stay still. That’s the way it is. Conscious of the impossible task, I resign. I cannot capture it. I cannot shoot the video. The dots are moving as I stare at them, still puzzled, marveled by their strangeness and beauty. The diagram, after all, is just a waste of time. I dreamt that a man looked back, over the anamorphic landscape of dreams, and that his glance was hard as steel but still fragmented itself in multiple glances each time more innocent, each time more destitute. I dreamt that a storm of ghostly numbers was the only thing left behind by mankind three billion years after the earth had ceased to exist. Javier Moreno lives in Barcelona. He is part of the editorial team of Hermano Cerdo, a regular contributor to Pie de Página and Ocho y Medio, and the author of La balada del elefante azul, a blog about elephants and mathematical logic. * The Bolaño diagram first appeared at El lamento de Portnoy and was originally created to accompany a review of 2666 in the literature magazine PiedePágina.